Oh man, you have no idea how much I love exploring natural areas in the city. (Well maybe you do now that you are reading these entries!) To me it just seems so contradictory - nature in an urban space and I celebrate every twist and turn, every nook and cranny and every surprising discovery. And yes again these dog walking paths didn't fail us, carving out a path down to the water and along the riverbank. I found a favourite shrub of mine (Beaked Hazel that has very unique seeds and fruit) and we ran into a gentleman that was another nature-lover and shared with us some of his top nature spots - including a local wood lot that is covered with Trilliums in the spring and he confirmed that the trail we were exploring did connect under a rail bridge and over to the urban stream that we were searching for! Winter is actually the perfect time to be out to discover what local fauna lives in the vicinity. You may not always SEE wildlife (that fuzzy or feathered charismatic "megafauna", of which we all enjoy seeing photos) but you CAN find evidence such as tracks, middens and browse and start piecing together the stories of your local wildlife. And any information like this, can bring you closer to actual wildlife sighting opportunities, as you start to understand the way they act and use a space. When I took a tracking class at school it was a winter course* (brrrr!) and every week, my classmates and I spent at least an hour outdoors with our observation sheets searching for this type of evidence around our campus. For each weekly outing, we had to report at least five "sightings" (evidence of animal activity). It might seem impossible during the quiet and stillness of this season but it's not as hard as you think! So first of all - what ARE tracks, middens, browse and other wildlife signs? Basically any piece of evidence that has been left behind by an animal is a sign that humans can use to learn about local wildlife and recent animals' habits. Animal signs also includes fur, quills, feathers and other such material that helps to confirm that an animal was in the area. These signs (as shown in the above list) give hints to the various activities of the local wildlife - whether while eating, stockpiling food, grooming, defecating or moving through an area. To be able to notice this type of evidence, it is recommended that you slow down your pace as you move through greenspaces and work at reading the landscape. Enjoy exploring your local wild spaces and find out more about who shares this local habitat with you. 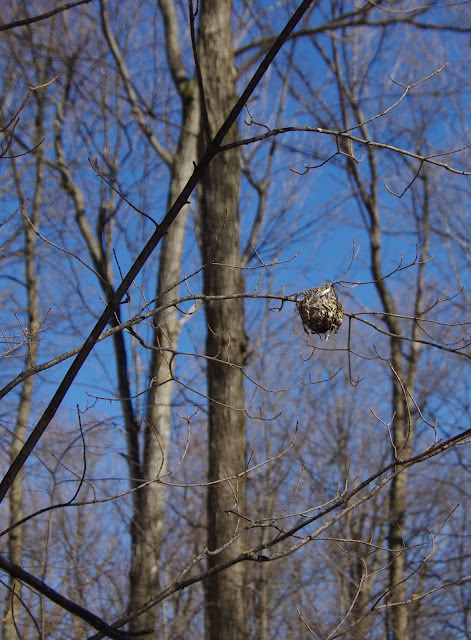 Winter and early spring are great times to locate nests before the leaves are on trees and if you make a note, you can revisit to see if they are being used by happy bird parents as the weather warms up. Spring is also a great time to look for animal tracks in muddy areas and lots more signs as mammals and other wildlife become more active. Sure you can say that some of it is luck and definitely much of it is due to patience. But there also is some need to consider timing and location if you seriously want to enjoy more wildlife encounters. There are times of the day and season when wildlife is moving and easier to find. Also by finding quieter spots and more dense greenspaces you will likely discover a larger and more diverse wildlife population. While seeking wildlife with others has its challenges, there are benefits to having more eyes to scan the landscape. To ensure that you don't end up walking too fast or engaging in distracting and loud conversations encourage your group to slow down and make a point of stopping every so often and tuning into all your senses. Enjoying nature at different speeds is great but disturbances from noise, movement and various scents can push animals into hiding. Up-level your skill by agreeing on some signs to communicate so that you don't even have to talk! Being with others of varying experience is also good as you can learn or share your knowledge. Many animals have impressive camouflage and some even adapt their camouflage to different times of year. Winter can be an especially difficult to spot wildlife - especially with the winter shadows and grey surroundings. Many times, it ends up being a movement or a sign (think owl whitewash) that betrays their location rather than a sighting of them against the backdrop of tree trunks, shrubbery, etc. So train your eye to scan for movement, investigate things that seem out of place and learn about the other type of signs mentioned above which will alert you to the presence of wildlife. As mentioned in another post ("How to Enjoy More Mammal Sightings"), the more you know about typical habits and preferred habitats and other key details, the more easily you will be able to spot things out in natural areas. You'll know if a specific type of wildlife is likely to be found in "forested areas" vs "open meadows". This goes for birds also. You can find various books about the habits of various fauna and make sure to ask your city library about resources that can help identify local wildlife seen in your area. For example: some owls return to the same roost each year and beavers can be found both in rivers and ponds. Other great resources for learning: local nature blogs and/or your local field naturalist club. You may have heard of the belief that whatever you focus on grows. I'm a big believer in that. Sending out gratitude is a great way to not only let nature uplift you but also to rev up those karmic juices. And if you would like to practice this - remember to celebrate everything you find - no matter how small! 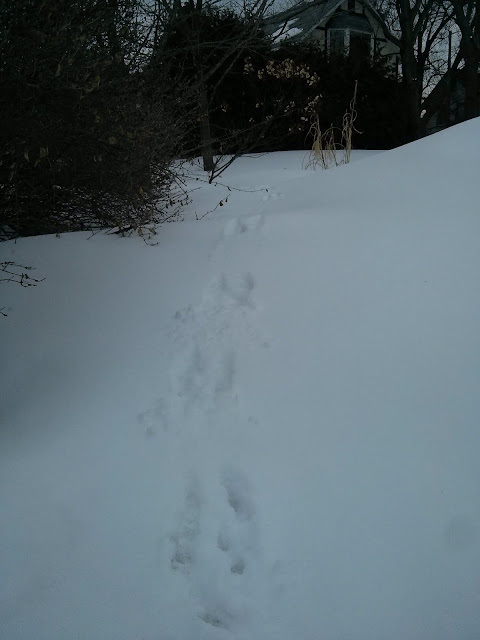 For me being outdoors is already a "win" and anything extra is a gift: the sun coming out of the clouds, small tracks in the snow, a warm "micro-climate" or even a bird riding a light breeze above. It can be animate or inanimate finds - both can be exciting if you get curious and understand how everything relates. Seeing the connection between everything links us closer to those ever elusive wildlife sightings. Trust that they will come, allow things to unfold as they want and try not to be too attached to the outcome. I myself have had an encounter with an owl on my wish list for a few years now. We finally spotted one on a snowshoe last winter although it was a distant sighting. I'm focusing on being in the owl's presence and being able to witness it, even if for a brief time. Gratitude! Each time I go out I remind myself of what I've seen before including an exciting quick blur of a long-tailed weasel in winter white and also a few backyard visits by a raptor - that was cool - spotting the large bird as I came down for an afternoon coffee! So let us know what type of fauna is on your wish list and whether you've been successful or not!